Are you considering applying for an American Express credit card? Whether your credit needs are for a personal or business account, you have more than 30 options from which to choose! Earn one point for every dollar spent on eligible purchases. Pay no annual fee for your first year of membership. In successive years the fee is $95. Since your balance must be paid in full each month, your account will accrue no interest charges. Does American Express Offer a Secured Credit Card? Apply for the Green Card on the American Express website. Earn one point for every dollar spent on eligible purchases using the Gold card. Pay no annual fee for your first year of membership. In successive years the fee is $125. Apply for the Gold Card on the American Express website. Earn triple points for flights booked with airlines. Earn double points at U.S. gas stations & U.S. supermarkets. Earn one point on other purchases. Receive 25,000 reward points when you use your new card to make $2,000 in purchases, within the first three months. Pay no annual fee for your first year of membership. In successive years the fee is $175. Apply for the Premier Rewards Gold Card on the American Express website. Receive complimentary access to the Airport Club, available in 600 locations. Save up to $200 annually on airline fees. Apply for the Platinum Card on the American Express website. Earn double points for eligible travel purchases made on the American Express Travel website. Receive 10,000 points when you use your new card to make $1,000 in purchases, within the first three months. This card carries no annual fee. Purchases are interest free for the first 12 months. After that, the rate is variable, ranging between 15.24 and 20.24 percent, based on credit worthiness. Apply for the Blue card on the American Express website. Earn three percent cash back at U.S. supermarkets, up to $6,000 per year in purchases. Earn two percent cash back at U.S. gas stations and select department stores. Earn one percent cash back on other purchases. Receive 100 Reward Dollars when you spend $1,000 within three months. Purchases are interest free for the first 12 months. After that, the rate is variable, ranging between 12.99 and 21.99 percent, based on creditworthiness. Apply for the Blue Cash Everyday card on the American Express website. Earn six percent cash back at U.S. supermarkets, up to $6,000 per year in purchases. Earn three percent cash back at U.S. gas stations and select U.S. department stores. Receive 150 Reward Dollars when you spend $1,000 within three months. The annual fee is $75. Purchases are interest free for the first 12 months. After that, the rate is variable, ranging between 12.99 and 21.99 percent, based on credit worthiness. Apply for the Blue Cash Preferred card on the American Express website. Members are allowed to check one bag free on every Delta flight. Members save time with priority boarding. Receive a statement credit for a 20 percent discount on eligible in-flight purchases. Receive 30,000 bonus miles toward future travel when you spend $500 within your first three months of membership. The interest rate is variable, ranging between 15.24 and 19.24 percent, based on credit worthiness. Apply for the Gold Delta SkyMiles card on the American Express website. Receive 20,000 bonus miles after your first purchase. 5,000 of the bonus miles are Medallion® Qualification Miles (MQMs). Receive 5,000 bonus miles by adding two additional members to your account at the time of application. The annual fee is $150. Apply for the Platinum Delta SkyMiles card on the American Express website. Earn annual Miles Boosts, up to 30,000 MQMs and 30,000 bonus miles when you spend $60,000 on eligible purchases in a calendar year. Receive 10,000 bonus miles and 10,000 MQMs after your first card purchase. Apply for the Delta Reserve card on the American Express website. Reward travel is possible with only 7,500 points. Earn one point for every eligible dollar spent. Receive 7,500 points after you spend $1,000 within your first three months of membership. The interest rate is variable, ranging between 17.24 and 22.24 percent, based on creditworthiness. Apply for the Blue Sky card on the American Express website. Redeem points for hotel stays or flights. Receive five Starpoints® on purchases at participating hotels. Receive one Starpoint for every dollar spent on eligible purchases. Earn 10,000 Starpoints after your first purchase. Earn an additional 15,000 Starpoints after you make $5,000 in purchases within the first six months of membership. Pay no annual fee for your first year of membership. In successive years the fee is $65. Interest rates are variable, ranging between 15.24 and 19.24 percent, based on credit worthiness. Apply for the Starwood Preferred Guest card on the American Express website. Receive seven Hilton HHonors Bonus Points on purchases made at with participating locations. Earn five Hilton HHonors Bonus Points for eligible purchases at U.S. restaurants, U.S. supermarkets and gas stations. Earn three Hilton HHonors Bonus Points for other eligible purchases. Receive 40,000 Hilton HHonors Bonus Points after you spend $750 within your first three months of membership. Interest rates are variable and range between 15.24 and 19.24 percent, based on credit worthiness. Apply for the Hilton HHonors card on the American Express website. Receive 12 Hilton HHonors Bonus Points on purchases made at participating locations. Earn six Hilton HHonors Bonus Points for eligible purchases at U.S. restaurants, supermarkets, and gas stations. Receive 40,000 Hilton HHonors Bonus Points after your first purchase. Receive an additional 20,000 Hilton HHonors Bonus Points after you spend $3,000 within your first three months of membership. Interest rates are variable, ranging between 15.24 and 19.24 percent, based on creditworthiness. Apply for the Hilton HHonors Surpass card on the American Express website. Receive 10,000 rewards points when you use your new card to make $1,000 in purchases, within the first three months. Receive five rewards points for every dollar spent on Mercedes-Benz purchases. Earn triple points at U.S. gas stations on transactions less that $400. Earn double points at U.S. restaurants. Earn one point for every dollar spent on other eligible purchases. Charge $5,000 in purchases annually and receive a $500 certificate toward the purchase or lease of a new Mercedes-Benz. Receive a $50 certificate toward Mercedes-Benz Accessories each year, when you renew your account. Redeem rewards points to pay for a variety of travel-related expenses. Mercedes-Benz will waive up to 1,000 excess miles at the end of your lease. Apply for the Mercedes-Benz card on the American Express website. Receive 50,000 rewards points when you use your new card to make $5,000 in purchases, within the first three months of membership. Earn triple points for flights booked directly with airlines. Earn double points on U.S. purchases for advertising in select media, shipping and at gas stations. 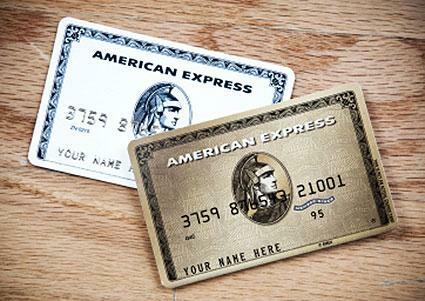 Apply for a Gold Rewards card on the American Express website. Carry a balance interest free for 60 days. Receive a 1.5 percent discount for paying early. The annual fee is $250. Apply for the Plum card on the American Express website. Receive 25,000 reward points when you spend $5,000 within your first three months of membership. Earn double points of purchases made at American Express Travel. Receive an annual airline fee credit of up to $200. Pay no annual fee for your first year of membership. In successive years the fee is $250. Apply for the Business Platinum card on the American Express website. Earn double miles on Delta purchases. Earn one mile for every dollar you spend on other eligible purchases. Receive 30,000 bonus miles after you spend $1,000 within your first three months of membership. Receive a statement credit for $50 by making a Delta purchase using your card within your first three months of membership. Apply for the Gold Delta SkyMiles Business card on the American Express website. Save time with priority boarding on Delta Flights. Earn double reward points on Delta purchases. Earn one reward point for every dollar spent on other eligible purchases. Interest rates are variable and range between 15.24 and 19.24 percent. Earn 5,000 MQMs and 35,000 bonus miles after spending $1,000 on your card during the first three 3 months. Earn a statement credit of $100 by making a Delta purchase during your first three months of membership. Apply for the Platinum Delta SkyMiles Business card on the American Express website. Receive complimentary access to the Delta Sky Club. Earn one mile for every dollar spent on other eligible purchases. The interest rate is variable, ranging between 15.24 and 19.24 percent, based on creditworthiness. Receive 10,000 MQMs after your first purchase. Apply for the Delta Reserve for Business card on the American Express website. Receive free cards for employees. Earn double points for each dollar spent on American Express Travel purchases. Receive 5,000 reward points after your first purchase. Apply for the Business Green Rewards card on the American Express website. Earn one reward point for every dollar spent on eligible purchases. Earn double points for every dollar spent on American Express Travel purchases. Purchases are interest free for the first six or 12 months. After that the rate is variable, ranging between 11.24 and 19.24 percent. Receive 10,000 reward points after your first purchase. Apply for the Blue for Business card on the American Express website. The Lowe's Business Rewards Card is a favorite among construction companies, home improvement contractors and property management companies. Earn triple reward points at U.S. restaurants, office supply stores, and wireless telephone services from U.S. providers. Earn double points on Lowe's purchases. Interest rates are variable and range from 13.24 to 18.24 percent. Apply for the Lowe's Business Rewards card on the American Express website. Earn two Starpoints for every dollar spent on eligible hotel and resort purchases. Earn one Starpoint for every dollar spent on other eligible purchases. Receive 10,000 Starpoints after making your first purchase on your new card. Receive 15,000 additional Starpoints after spending $5,000 during your first six months of membership. Apply for the Starwood Preferred Guest Business card on the American Express website. Whether you are a frequent traveler, looking for high-end rewards, or someone who just wants to track your expenses more carefully, American Express has a credit card for you. As offers are subject to frequent change, please carefully read the terms and conditions of your account.